The damage to roads caused by commercial heavy vehicles is a problem familiar to us all. It is influenced not only by the behaviour of the vehicles themselves but also by the properties of the road materials used. A study of this phenomenon therefore requires interaction between civil and mechanical engineers, which is relatively easy to establish in a multidisciplinary centre for research such as that found at the Cambridge Engineering Department. Dr David Cebon, together with Professor David Newland, has been instrumental in setting up an 'exclusive club' known as the Vehicle Dynamics Consortium, to look specifically at the 'road friendliness' of heavy vehicles in terms of the impact they have on road surfaces and their safety. This club, a collaboration between Cambridge and Cranfield Universities, will include around ten member companies with the aim of building a concept vehicle ie a very advanced heavy vehicle which will do minimum damage to roads and have maximum safety in terms of roll-over, braking, etc. 'Each company will represent a different sector of the industry, for example one tyre manufacturer, one manufacturer of braking systems, one of shock absorbers,' explains David Cebon. 'In this way, different sectors of the industry can work together in a non-competitive, co-operative environment.' A grant application has been made to the SERC to fund the work over a five-year period to a level of £700,000 which will be matched by the industrial members in cash and in kind. Cebon's group is already experienced in this type of work. 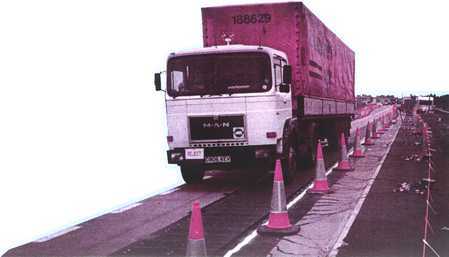 A major survey of the impact loading caused by heavy vehicles was carried out in Oxfordshire in 1992. Two thousand vehicles were monitored while driving over a purpose-built, load-measuring mat, on a section of the A34 near Bicester. Even to mount that operation, which involved coning off a section of the highway, was a feat in itself. The results showed that the highest levels of road damage are generated by vehicles with air suspensions - a surprising result in view of the recently introduced EC regulations encouraging the use of air suspensions! This anomalous result appears to be due to poor suspension maintenance standards. For further information contact Dr David Cebon on (01223) 332665.